Wood Stage Station is something you should read. 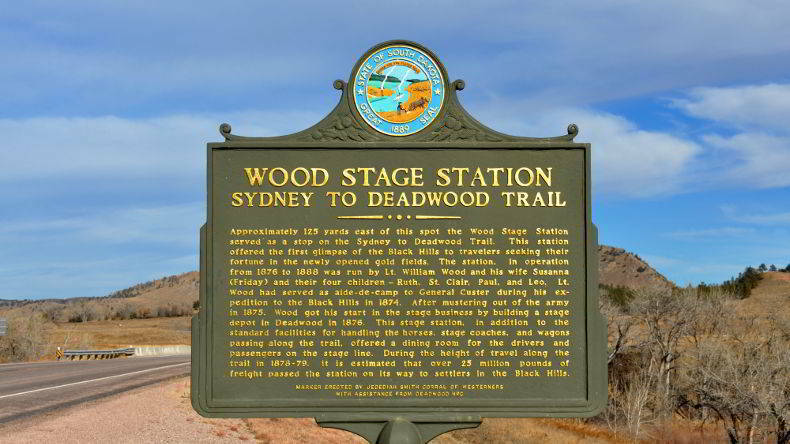 Approximately 125 yards east of this spot the Wood Stage Station served as a stop on the Sydney to Deadwood Trail. This station offered the first glimpse of the Black Hills to travelers seeking their fortune in the newly opened gold fields. The station, in operation from 1876 to 1888 was run by Lt. William Wood and his wife Susanna (Friday) and their four children - Ruth, St. Clair, Paul, and Leo. Lt. Wood had served as aide - de - camp to General Custer during his expedition to the Black Hills in 1874. 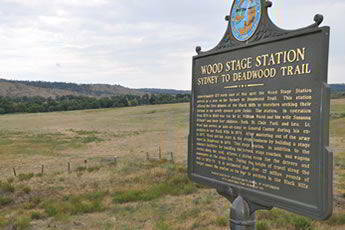 After mustering out of the army in 1875, Wood got his start in the stage business by building a stage depot in Deadwood in 1876. This stage station, in addition to the standard facilities for handling the horses, stage coaches, and wagons passing along the trail, offered a dining room for the drivers and passengers on the stage line. During the height of travel along the trail in 1878-79, it is estimated that over 25 million pounds of freight passed the station on its way to settlers in the Black Hills.